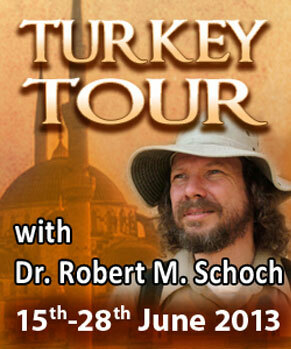 I have led tours to Egypt, Turkey, Peru, Bolivia, Easter Island, Malta, and other countries over the years. Indeed, I have new tours coming up that I'll be announcing soon. If you have a group interested in a personalized tour, please do not hesitate to contact me. 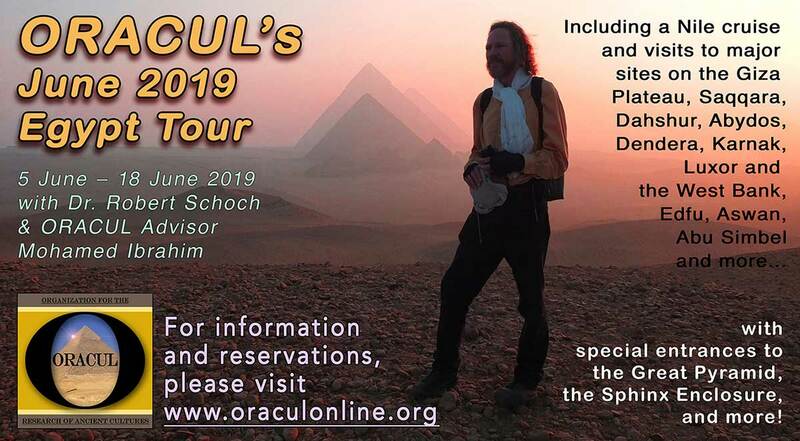 Katie and I, working with our ORACUL partners, recently put together two tours to Egypt for the late spring of 2019 (a May tour initially, and then a June trip after the May tour filled quickly). We are so pleased by the public's response: both tours are filled to capacity! For those who would like to see the trip's itinerary, here is the tour's webpage. If you would like to be either added to the waiting list or to ORACUL's mailing list for future trips, there is a contact portal at the bottom of the page (and also on the homepage). Additionally, if traveling to Egypt or elsewhere interests you, please drop Katie and me a note (see my Contact page for how to do this) and let us know you would like to be on our personal mailing list. There are times, for various reasons, when Katie and I only announce trips privately. 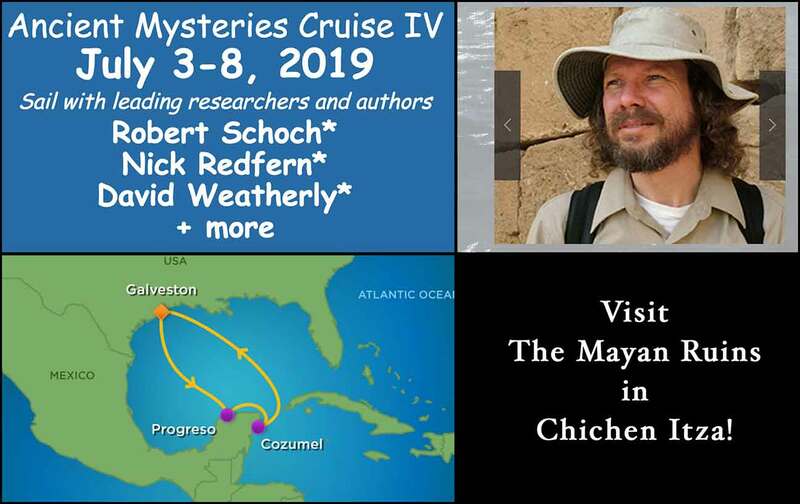 I have been invited to cruise to Mexico to see the ancient ruins at Chichen Itza -- and so I invite you to join Katie and me for the journey. While sailing, I will present my own research, as will other co-hosts, and we will have plenty of opportunity for conversation and on-board fun. I am not the organizer of this tour; just a participant. For more information please see the Holiday Maker Travel website. Additional upcoming announcements will be posted (above) soon. Below are a sampling of past events. 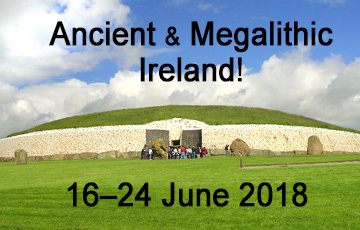 In June of 2018, Katie and I, along with our friend and tour organizer Andrea Mikana-Pinkham, hosted a week-long tour of the ancient megalithic sites of the Emerald Isle. Together we visited places that harken back to extreme antiquity. We took in the beautiful countryside, shared meals (organic and non-gmo) and conversations, as we journeyed across the island together. I gave two formal presentations about my overall research into the extreme antiquity of civilization, and Andrea gave two presentations on her work as well. Our thanks to so many who made this a wondrous adventure. In March of 2017 I was thrilled to lead a 7-day tour of the wondrous Mediterranean island nation of Malta. 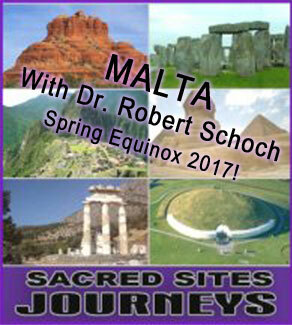 The trip was organized by Andrea Mikana-Pinkham and Sacred Sites Journeys. Malta is home to some of the most mysterious sites and structures of the ancient world, including megalithic "temples", the world famous and deeply problematic "cart ruts" preserved in solid stone, and more. It is my hope to conduct another tour to Malta again soon. Please let me know if this should interest you or a group of 20 or more of which you are a part. 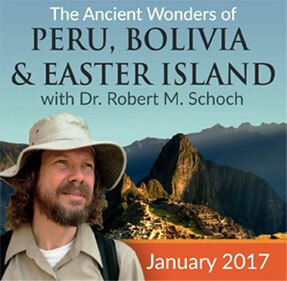 In January of 2017, as in years past, I led a two-week tour to Peru and Bolivia, with a 3-day add-on to Nazca prior to the main trip and a 3-day add-on to Easter Island afterwards. Katie and I again teamed up with our friend and colleague, tour organizer Gregory Poplowski, for this wonderful adventure. For those who missed it, please let us know and perhaps we can organize another one. I've had the pleasure of leading (as guest speaker) a number of tours to Turkey with my friend and colleague, Grzegorz ("Gregory") Poplawski. His company, The Time of a New Era, takes care of all the logistics for the tours (he is the official organizer). I speak on site, give lectures during selected evenings, and explore the ancient wonders of Turkey together with our guests (there is always something new to learn!). If you and your group (of 20 or more) would like to arrange a tour like this especially for yourselves, please feel free to contact me. Over the years I have led many tours to Egypt, and plan to do so again in the future (I am tentatively working on organizing one for possibly next year). As an example of one of my previous Egypt trips, for the very special December 2012 holidays - including the Winter Solstice, Christmas, and New Year's - our trip included visits to the Pyramids of Giza, the Great Sphinx, the Coptic church of the Holy Family, and a Nile cruise, with stops at Karnak, Luxor, the Temple of Queen Hatshepsut, the Temple of Edfu, Abu Simbel, and much more. We even visited the pyramid and labyrinth area of Hawara. I lead Egypt tours quite regularly, with different organizers, so if you would like to join me on a trip, please let me know. This website was designed and constructed by my wife. All photographs and text posted to it, unless otherwise specified, are the copyrighted property of Robert M. Schoch and Catherine Ulissey. Please do not use without permission. Solar images are courtesy of NASA. Click here for a site map.